General news about the Club and other items of boating interest. An increased interest in two-person offshore sailing events such as the Olympics, the World Championships and the Fastnet Race has prompted the RYA and Royal Ocean Racing Club to double up and help develop double-handed offshore sailing in the UK. 22 April 2019 will mark 50 years since Sir Robin Knox-Johnston & Suhaili completed the first solo, non-stop sail around the world on his return to Falmouth. Presumed lost at sea for over four months until only a few weeks before crossing the finish line this pioneering achievement occurred during 1969, the year of the first moon landing. Public celebrations take place in Falmouth during Easter to include a parade of sail with Sir Robin & Suhaili recreating the historic moment of crossing the finishing line. Thursday 18 April: Gosport Premier Marina 0800 - Sir Robin departs for Falmouth on board Suhaili. Interviews & photos available on departure. Saturday 20 April: Sir Robin & Suhaili arrive in Falmouth with an escorting flotilla: Timing TBD. Sunday 21 April: North Quay, Falmouth 1200 midday: - footprint bronze cast unveiled, marking his first steps back onto land after 312 days at sea. A flotilla of supporting yachts will assemble at St Mawes throughout the afternoon with 40 mooring buoys available for boats up to 12m; boats >12m are to contact HM on 01326 270553 or email: info@stmawesharbour.co.uk. St Mawes Sailing Club 18:00 - 20:00: party in conjunction with the Cruising Association, Little Ship Club & Clipper Ventures (tickets £25pp); those not attending by boat can book a special return charter ferry from Falmouth to St Mawes. Monday 22 April: National Maritime Museum Cornwall (NMMC) 0930-1130 - "In Conversation with Sir Robin Knox-Johnston & Mike Golding OBE” (tickets £18pp). Falmouth Harbour 1300-1600: 'On the Water' spectacle with Sir Robin & Suhaili plus a flotilla of supporting vessels to re-enact the exact time (1525) that Robin crossed the finishing line. Supporting vessels are welcome to join in or otherwise view from the land, e.g. Pendennis. The NMMC is staging an exhibition throughout the summer starting April 8 with items & photographs from Sir Robin's personal collection plus a commemorative documentary. Robin Knox-Johnston celebrates his 80th birthday with a series of monthly talks lasting 80 seconds entitled “The Lure of the Sea”. Episode One describes why he keeps returning to the sea and what his future plans might be. UK pleasure craft can enter Belgian ports this summer without risk of fines for using UK red diesel, provided evidence of having paid 100% duty (not ‘60/40’) is available. In the unlikely event of it being requested, be sure to keep your 100% duty-paid receipts on board before leaving the UK. However, only white diesel is permitted in any spare carry cans. Use a copper-based paint with an anti-slime additive. Sail-drive legs made of aluminium should use zinc-based antifoul. Clean with a soft brush and non-scratch pad then give a good wax & polish. Go aloft to check the masthead mounting points are secure; holes for wiring are sealed with silicone; furling shackle is sound; tangs & stay end-fittings are good; halyard & boom lift shackles, blocks & sheaves turn easily; tangs & spreader end-fittings are sound; mast step thru-deck wires are watertight; gooseneck is sound; mast is straight, stays are tight and mast pre-bend appropriately set up. The whole system - drum & bail, turnbuckle & lower clevis & split pins, foil sections & fasteners and the top swivel should be inspected. (Tying the bosun’s chair to the foil sections with a small loop helps avoid swinging backwards). Flush any dust & dirt from any open bearings on the drum with hot water. Open the winches and use a solvent to dissolve the old grease. Re-grease the bearings, drums & pawls and reassemble. Turn the wheel/wheels hard in both directions for play in the system indicating a need to tighten wires at the quadrant or weak fasteners in a torque tube installation, especially where the tubes change direction. Check: Sheaves for wire (or mounting brackets for tubes) where failures can occur; Cast quardrant for cracks; Rudder key aligning the quardrant; Autopilot attachment to its rudder post and key; Rock the rudder sideways (if out of the water) to test for play in the bearings or cracks in the mounting. Ensure seacock valves turn easily and are free from corrosion or electrolysis. Check hoses are in good condition, secured with two stainless steel clamps and that wooden/rubber bungs are handy. Change oil, oil filter & fuel filters and drain off any water in the fuel filter housing. Check raw water impeller for brittleness or signs of fracture around the base of each fin; also the raw water anti-syphon loop. Ensure the drive belts are free from brittleness, hard spots or need for tightening. Zincs anodes - are usually in the heat exchanger, back of exhaust manifold or elsewhere including prop shaft. Check the prop shaft attachment to the transmission for wear. Stern gland leakage should be marginal and only when the shaft is turning - controlled by the stuffing box packing. Rock the shaft & P-strut (if out of the water) for play in the cutlass bearing or attachment problems. Replace worn anodes on the shaft and propeller. Inspect the rubber gasket on sail-drives for leaks or wear. Ensure wet battery cells are topped up with de-ionised water. Keep them in the top third of amp-hour cycle after relaunch to refresh the discharge/recharge activity. Flush the empty domestic tanks with a couple of five gallon buckets of mild bleach solution, pumping it through the system one faucet at a time before flushing and filling with fresh water. UK-based vessels will lose EU VAT-paid status on ‘no-deal’ Brexit-day or at the end of any transition period. However, if located, at that time, in an EU port or sailing in EU waters it will keep its VAT-paid 'Union' status. It should be borne in mind that non-EU citizens sailing in EU waters will only be allowed to stay, in person, for a maximum of 90 days in any 180 whilst then leaving their boat in the EU in order to retain its Union status. A UK-based yacht will lose it’s EU VAT-paid status and become liable again 18 months after any sustained period of re-entry into the EU (i.e. on expiry of EU ‘Temporary Importation Relief’). In summary, UK-based yachts wishing to stay in the EU longterm should be located in an EU port on Brexit day in order to retain their EU VAT-paid status (keeping marina receipts, dated photographs, insurance certificates etc as evidence). Conversely, a British ‘EU-based’ yacht may become UK-VAT liable when eventually 'imported' back into the UK (currently after 3 years). see News item ‘T2L’ 13th Dec 2018 for instructions on completing the application form. 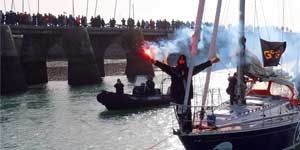 ‘One and All’ has claimed 3rd place on the podium, having arrived back in Les Sables d’Olonne after completing a non-stop single-handed ‘Golden Globe’ race around the world. Previously owned by GCCC Past Commodore Tony Atkins and circumnavigated by Uku Randmaa of Estonia, ‘One and All’ crossed the finishing line at 0900 UTC today after almost 252 days at sea (and with only three packets of powdered soup left in the larder!). see previous GCCC News items of 29 Jan 2019 & 9 Oct 2018. Tracy Edwards, guest speaker at GCCC clubhouse last year, says she did not form an all-women crew for the cause of feminism, but to do what she simply loved doing best - sailing; and then going on to skipper a 58’ yacht ‘Maiden’ in the 1989 Whitbread Round the World Race (precursor to the current Volvo Ocean Race). ‘Maiden’ is now the subject of a film documentary about Edwards’ struggle to put a female team on the water while tolerating chauvinism within the yachting community and rejection from potential sponsors. The film, ‘Maiden’, features interviews & original film footage of the 1989-90 race and is due for release in UK cinemas from today - International Women’s Day! The Summer Programme 2019 has been published with events now open for registration. This year’s 'Stowaway Register' is also now open. The club’s annual two-week Summer Cruise has now been published. A separate ‘Crewing’ webpage has been added for more focused information. 'Other’s Sailing Plans' has been re-named 'Other Sailing Opportunities' to provide a facility for members to link up outside the club’s more formal Summer Programme. Potential 'News' items for the Home page can be emailed to club member Leon Barbour for editing &/or uploading. Check out the club’s ‘Sale or Wanted’ section where over 30 items of sailing gear are up for sale!